After two weeks of play, things are finally starting to get a bit more clear when it comes to defining a preliminary power ranking. Some teams rose to the occasion, other fumbled a bit whereas we still have two teams that are yet to show anything worth mentioning on the Rift. So without any further ado, let’s take a closer look at this week’s games! ROCCAT vs. Giants Gaming – The first match of the week isn’t particularly engaging. It’s a fight between two middle-of-the-pack teams and it carries no significance overall. For ROCCAT, this is a good match to continue building up hype and momentum after getting smashed by Schalke 04 last week. They’re a very capable team overall and the fact that they were able to maintain their level of play from Spring over to Summer is very commendable. That said, if they don’t manage to get Memento and Blanc going, they’re all out of tools and win conditions. As for Giants, they’re still a mediocre team by all metrics. They’re not bad, not even close, but even in their highs you don’t really see a top tier team in the making. It’s always a bad call made or an engage gone awry. They were close to taking down the Unicorns of Love but after a botched Baron call they were aced and subsequently lost the game. Will they be able to pick things up in the weeks to come? Perhaps, but ROCCAT is currently head and shoulders above in almost all facets of play. Tomorrow’s game should be yet another good example of Memento’s shotcalling and dominant play and paired with the rest of ROCCAT, they shouldn’t have too much trouble in taking Giants down. Schalke 04 vs. Misfits – This is where things get a lot more interesting. Schalke is still inconsistent. They were absolutely demolished by G2 last week, it wasn’t even a competitive game overall. Things started off with Vizicsacsi inting in a tank match-up even before level six. That started off a snowball and it didn’t take for long before Perkz was leaving a mark (a quadra and a pentakill) as a fed Kai’Sa. It was a stomp from start to finish and it served as a reminder of just how strong G2 really is right now. Fortunately, Schalke was able to rebound very nicely against ROCCAT. Essentially, they did exactly what G2 did to them just a day prior, albeit with a different team comp. Both games serve as perfect examples of the duality that exists with Schalke. They either impose their own playstyle or crash and burn almost immediately. They were proactive and were always willing to engage – attack first ask questions later, and outperforming a solid team like ROCCAT at such a degree is not something to scoff at. That said, Misfits are arguably the hottest team in the region right now. They’re one of two 4W-0L teams – the other being G2, and they’ve been looking absolutely insane overall. Sencux was absolutely insane on both Irelia and Yasuo, and he is one of the biggest reasons as to why Misfits are dominating right now. With a fantastic midlaner that’s killing people left and right, Misfits don’t really have a weak lane – in fact they have some of the best players in every single position. Where was this Sencux throughout the entirety of 2017? No one really knows, but he’s finally echoing his 2016 Worlds performance, back when he was able to go toe-to-toe with the likes of Bjergsen and Xiaohu. Not to mention their top tier coaching staff and fantastic versatility when it comes to the pick and ban phase. They can play any pick and go for any team comp which gives them a huge upper hand regardless of the opponent. While Schalke is looking fairly good right now especially when Amazing gets to engage and set up plays, it’s impossible not to give Misfits the benefit of the doubt. They’re all performing at an incredibly high level and there’s no reason as to why they wouldn’t keep their winstreak alive. That said, this could be a bit closer than most people expect. H2K vs. Splyce – Now while this match is as far from exciting as you can get, it’s still an incredibly important match for both teams. H2K, even though they were able to reach the Top 6 in Spring look like a completely different team right now. They’re completely oblivious to what’s the most optimal way to play the game right now and it shows on the Rift. To their credit, they didn’t really have an easy schedule for the beginning of the Split, but you’d still expect a somewhat solid team in Spring to show up and do some damage. That’s only wishful thinking as they not only failed to put up a worthy offensive, but they essentially just rolled over and surrendered. They’re able to keep up in the early game, but it’s always a botched engage or an illogical play that seals their fate. Looking ahead, it’s really hard to find a team that they could win against. The Unicorns have essentially taken their Top 6 spot right now, and even Giants have more cohesion and synergy to stave off any H2K offensive. Sheriff is no longer able to dish out insane damage in the current meta and Shook’s experience and shotcalling isn’t as effective as it once was seeing how every team developed and improved over the mid-season period. As for Splyce, well, they’re not much better. They’ve been trying their hardest and you can see that on the Rift, but it just wasn’t enough. They had a tough strength of schedule, but still – they were Top 3 in Spring. This is an unacceptable level of play from a team that’s going to be representing the region at Rift Rivals next week. They don’t have a good read on the meta and they’re not fixing their mistakes in time. That said, they’re still a team filled with experienced veterans and shotcallers. They have the mechanical skill, they have the knowledge, it’s only a matter of time before they’re able to step up and improve. We’re going with Splyce on this one but not with full confidence. They showed some signs of life against Misfits – arguably a Top 2 team right now – even when they had a serious gold deficit, so they should be able to take down H2K and secure their first win of the split. Unicorns of Love vs. Team Vitality – Another fantastic match-up, even though it’s probably not that alluring to the masses. The Unicorns have cemented themselves as a very solid middle-of-the-pack team, and even though they’ve been able to upset fairly frequently in the Spring Split, the fact that they’ve been able to enter the Summer Split and continue playing at a fairly solid level is a great testament to Sheepy’s coaching. In hindsight, it makes perfect sense. This meta is absolute chaos, and if there was ever a team that could thrive in such an environment then that’s the boys in pink. They’re more focused on objectives and their early and mid games are far better. They’re no longer focusing on late game teamfighting exclusively which is a very nice sight to see – it’s rare to see the Unicorns change things up and actually evolve as a team. Perhaps the biggest reason why they’ve been able to play at such a solid level is the fact that Exileh has been playing far better than most people expected. He’s still far from a top tier midlaner but at least he’s not inting – as we’ve become accustomed to over the last two years. (give or take) He can actually create a solid amount of pressure in the mid lane and his Irelia and Aatrox last week were actually very solid. If he manages to maintain his current level of play then UOL can actually become a threat. Totoro was also an unexpectedly big factor in their wins. He has some of the cleanest Pyke play in the entire region, and he was constantly roaming to the mid lane, trying to get Exileh ahead – and succeeding more often than not. Vitality on the other hand had a pretty abysmal week two. Their second game against Fnatic was almost sad even. They tried their best and yet not only was it not enough but they made multiple egregious errors and the game completely snowballed in Fnatic’s favor. “Snowballed” is perhaps even an understatement. It was over even before the tenth minute mark. It was a classic display of Vitality’s playstyle – kill or be killed, there’s no in between. That said, they have a fantastic grasp on the meta, and they could have won their game against ROCCAT had they not made a couple of bad calls in the late game. They’re a strong team, but they just need to tidy up a couple of things. Whether or not they’ll be able to return back to form in time for this week’s matches remains to be seen. We’re going with the Unicorns of Love on this one. While it is an upset, they’ve proven to be worthy of such a challenge. If they’re able to survive Vitality’s early onslaught, they should be able to take the win. That said, this is far from a safe bet, and it’s best if you simply skip this match if you’re not willing to risk it. Fnatic vs. G2 eSports – And finally, the epitome of top tier League of Legends and the match of the week. If you only have the time to watch a single game this week, make sure it’s this one. This is also a match that will decide which team belongs in the Top 2 along with Misfits. G2 eSports are without a doubt one of the strongest teams in the region right now. The level of play that they’ve displayed over the last two weeks was absolutely insane, and the fact that they were the only team that pulled off the funneling strategy to perfection twice last week really shows how good they are in the current meta. Everything is going in their favor. Wunder can finally get off of tanks and get on some bruisers and carries, Jankos displayed incredible versatility as he was able to play Braum to perfection and assist Perkz against both Schalke and H2K, Perkz is… Perkz and their bottom lane can finally play without pressure. They don’t have to carry – they can help out on picks like Karma, Fiddlesticks, Heimerdinger and so on. The current meta is perfect for a team like G2 eSports and they’re entering this week’s matches with a ton of hype and momentum. 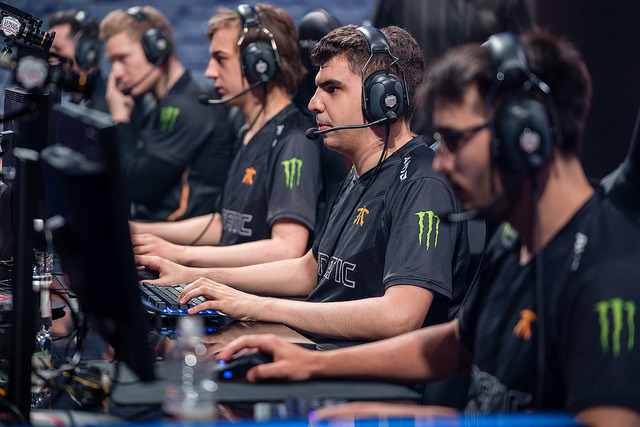 As for Fnatic, both of their wins last week weren’t just clean – they were absolute dominations. It wasn’t even pretty to watch, it was like a clash between a top tier LCS team and five solo queue strangers. Substituting Bwipo in the bottom lane paid off in spades, as he was able to dominate regardless of the match-up. He also displayed fairly solid synergy with Hylissang as they were able to take on not just Sheriff and promisq but Attila and Jactroll as well. They’re all performing at such a high level and the fact that they can swap between Rekkles and Bwipo from game to game is an incredible advantage. We’re going with Fnatic on this one. They know the importance of this match, it’s not just for the bragging rights but for settling the rivalry as well. It would also improve their position in the standings. They know G2 inside and out and they showed it in the 2018 Spring Split finals. With a solid read on the meta, they should be able to take down G2, however it won’t be easy. Misfits vs. H2K – What a stark difference just a couple of months can make. Misfits went from barely missing the playoffs in the Spring Split, to being the best team in Europe (or at worst Top 2) in Summer. They’re currently sharing the number one spot in the rankings with G2 eSports, with five wins and zero losses. Their latest win against Schalke yesterday was an absolute masterclass. It was slow, calculated and above all – clean. It took them a while to get first blood – fifteen minutes, but they weren’t idling on the map. They were getting objectives down left, right, and center. With four turrets to zero and two elemental drakes in their pocket, they went for an uncontested Baron and eventually just closed out the game. There wasn’t a lot of bloodshed, as both teams focused on macro instead. That said, it was far from a boring game. As for H2K, they remain the only team in the region without a single win and by the looks of it, they’re ending week three with six losses in total. There’s really nothing positive to say about this squad at the moment. To make matters worse, they’ve shown absolutely no progression over the last three weeks and there really isn’t an opponent that they can take down as every single team is playing at a much higher level right now. Betting on Misfits would be the more logical choice. Team Vitality vs. Schalke 04 -Vitality were able to come back to their winning ways yesterday at the expense of the Unicorns of Love. Their aggressive early game was too much for the Unicorns to handle. By the fifteen minute mark, Vitality were up over ten kills and almost ten thousand gold. They were constantly rotating around the map, going for turret dives left and right and it paid off. It was a demonstration of just how strong Vitality are when they start off on the right foot, and it’s a frightening sight to behold. As for Schalke, well, you could argue that yesterday’s game was their worst so far. They were so afraid and reactive against Misfits that it’s hard giving them any benefit of the doubt going forward, especially against the likes of Vitality who play the “feast or famine” playstyle. If they get just a small lead early on they’ll snowball out of control. While it’s very possible for Schalke to make this into a highly competitive scrap, Vitality should be more than capable of emerging victorious. Giants vs. Fnatic – Even in their loss to G2 eSports yesterday, Fnatic really didn’t lose any stock. They still went with their comfort picks, it just turns out that G2’s funnel comps are currently unbeatable, even by the likes of Fnatic. They started off well with first blood on Wunder and later on to Jankos, but the moment G2 decided to pull the trigger, there was nothing that Fnatic could do. They also displayed some abysmal decision making and positioning, with individual members getting picked off on a fairly frequent basis. Their twenty minute Baron call was arguably the worst one of the Split. Not only did they get the Baron down to two thousand health for G2, but they were also aced in the process. In short, it was far from a good performance as they were outplayed on all fronts. As for Giants, they did improve from last week. They almost took down ROCCAT which is nothing to scoff at. That said, they have too many holes in their game overall, and any top tier team will have no trouble in exploiting them. They’re playing fairly well on an individual level, but there’s always a bad call that seals their fate. That said, if they continue improving they might be able to upset sooner rather than later. Betting on Fnatic would be the more logical choice here. They want to get back to their winning ways, and they need any momentum that they can get coming into Rift Rivals next week. Splyce vs. ROCCAT – This is where things get a bit spicy. Neither team looked particularly dominant nor strong yesterday, however ROCCAT should have the edge in every way, shape, and form. Their win against Giants was a solid one, however the fact that Giants were able to go blow-for-blow for the majority of the game isn’t such a promising sign for ROCCAT. Even though they were able to pick off Giants members on a fairly frequent basis, they were unable to really get anything going for the majority of the game. Things could have gotten either way – until Giants decided to go for a very unfortunate Baron call. It seems like their Baron calls go from bad to worse each week and the fact that they’re losing games because of just a single decision is a pretty big bummer. Splyce on the other hand were just a smidge better than H2K yesterday. They were more proactive and a lot faster on the map, and their superior teamfighting eventually took over – as was expected. They’re far from a top tier team, but at least they have the basics down to a tee. It was a refreshing sight, seeing the Splyce boys finally smile on stage after two weeks of absolute mediocrity. That said, they have a long road ahead of them if they want to contest for the playoffs. Prior to yesterday’s match, we were leaning towards Splyce, but that was just wishful thinking. Sure, they beat H2K, but there really wasn’t a winner after that game. It only served as a decider for who gets to be tenth. This is in many ways a must win for Splyce, but ROCCAT are no slouches. They seem kind of mediocre at first sight, but when you delve a bit deeper you can see that they’re all playing at a fairly high level. While it probably won’t be that clean nor dominant, ROCCAT should emerge victorious. G2 eSports vs. Unicorns of Love – We have a fairly interesting clash for our final match of the week. The Unicorns were unable to emerge as a true contender yesterday as they failed to mount a worthy offensive against Vitality. It was a shellacking from start to finish, and even though Vitality were favored from the very get go, it was still surprising to see just how weak the Unicorns looked. As for G2 eSports, it seems like they can go for any kind of draft right now and still get away with it. Putting Jankos on Tahm Kench and Wadid on Rakan is yet another crazy team comp that they pulled off to perfection. When the mid game came, they were incredibly proactive, always at least one step ahead of Fnatic on all fronts. The fact that they won isn’t surprising, but the way in which they won is. They outclassed Fnatic from start to finish. While the Unicorns might be able to make things a bit complicated from a stylistic stand-point, G2 should have no problem in taking them down.